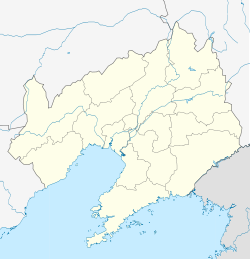 Fengcheng (simplified Chinese: 凤城; traditional Chinese: 鳳城; pinyin: Fèngchéng; literally: 'Phoenix City') is a city in the southeast of Liaoning Province in Northeast China. Administratively, it is a county-level city under the administration of Dandong, the downtown of which lies 45 kilometres (28 mi) southeast of the city. Formally known as the Fengcheng Manchu Autonomous County, its city status (a county-level city) was approved in 1994. There are 3 subdistricts, 18 town, and 1 ethnic township under the city's administration. This Liaoning location article is a stub. You can help Wikipedia by expanding it. This page was last edited on 28 March 2019, at 17:51 (UTC).